Guitar bag for 40/41/42 inch acoustic folk and classic guitars. Made of high-quality water-resistant material, durable and hard-wearing. Adjustable shoulder strap with cotton padded, suitable for different persons and comfortable to wear. 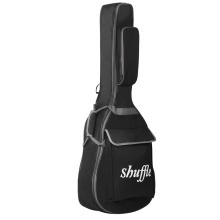 With side handle for carrying by the hand, and 2 outside pockets for music book, pedal, cables, tuner, capo, etc. Only the guitar bag is included.